Get the Best-Selling Book, Learn Hypnosis... Now! Imagine what it will be like to learn one of the most powerful and misunderstood talents in the world... how to hypnotize people! Your friends, family, relatives and peers will be amazed at the wonderful things you've learned. Once and for all, you'll shatter the mystery and find out what hypnosis is really about when you buy Learn Hypnosis... Now! Hypnosis is real, amazing and extremely powerful. Skeptics beware: you'll have to find something else to disbelieve once you read Learn Hypnosis... Now! 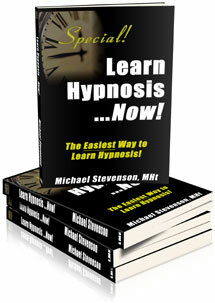 Hi, I'm Michael Stevenson, the author of Learn Hypnosis... Now!. When I quit a terrible smoking habit years ago using a self-hypnosis tape I bought at the county fair, I become instantly hooked on hypnosis! But I thought for sure that you must have a psychology degree or some other secret knowledge to learn how to hypnotize people - I had no idea how wrong I was. Countless trips to the library and bookstore yielded little or no results... there were literally no other good, easy to read books on hypnosis available! It took me years of research and training to learn this wonderful skill which literally saved my life. Now, I've taken all the knowledge that took me so long to learn and boiled it down into this one single book which is easy and fun to read and will have you hypnotizing people within hours, not years. Hypnosis requires no special powers. All you have to do is know what to say. Not only will I teach you exactly what to say, but I'll give you a handy reference card to print out that contains a real hypnosis induction in the free Power of Ten bonus that I'll tell you about in a moment. This is the book I wish I had when I was starting out with hypnosis. Your purchase includes The Transform Your Destiny Collection, my gift to you, valued at nearly $100! "I had many a reservation toward reading a book on hypnosis, however, due to the recommendations of a close friend, I decided "What the hell?" Within the first few pages, you'll probably find yourself infected with the author's enthusiasm, and that "infection" won't let up until you're finished with the last page - thus making "Learn Hypnosis...Now!" very fun to read." Click here to buy it now - Immediate eBook and bonus gift download with every purchase! Special: Order right now and you'll receive a free gift - The Power of Ten Collection a $100 value - including ten amazing gifts..
Now you can become one of the elite group of people who know the secrets of hypnosis! We'll take the mystery and the "hocus-pocus" out of hypnosis and give you the facts, in plain, easy to read English. No PhD is required. No degree or even knowledge of psychology is needed. There is no age limit, no restrictions. Yes, even you can Learn Hypnosis... Now! How to hypnotize anybody using different styles! Plus, as a special bonus: You'll get hypnosis scripts for things like quitting smoking, breast enlargement, losing weight, hypnosis inductions, trance deepening and more! "Excellent, easy to read and a great source for anyone. Presented in a real, understandable format with clear reference's and examples." "A must for anyone looking to gain or improve their knowledge of Hypnosis." But, the only way you can learn hypnosis now is by knowing the fundamentals, and the only way to learn the fundamentals is to buy Learn Hypnosis... Now! today! Hypnosis changed my life, and it will change yours as well! "I purchased several books on hypnosis, read them all and basically tried to glean as much as possible from them. If I had to recommend any single book on the subject it would be "Learn Hypnosis... Now!" By Now, you're probably thinking that this is a pretty good deal - I'll make it even better. As my special gift to you, I'll give you a free mp3 hypnosis induction so that you can experience hypnosis for yourself! This hypnosis induction was created and recorded by me, so I know you'll enjoy it. "I am dropping you this email for two reasons. First of all I presented my presentation on Hypnosis yesterday and everything went very well, and I used a lot of the information in your book. More so than any other of my sources even, so congrats on writing a nice consice book! " And remember, once you buy Learn Hypnosis... Now!, you'll get The Transform Your Destiny bonus gift, plus you'll be entitled to a host of free advice, members only specials and discounts on upcoming products. Author of Learn Hypnosis... Now! P.S. - Remember, while supplies last, I'd like to give you my Transform Your Destiny bonus, a $100 value, just for buying the book. You can download it immediately after purchase. I personally compiled this collection of ebooks, references and important hypnotherapy forms and I know you'll love it. But, you can only get it with your purchase, so buy Learn Hypnosis... Now! P.P.S. - Remember, your satisfaction is 100% guaranteed! If you don't like the book, simply return it, get all your money back and keep The Transform Your Destiny Collection - it's my free gift to you. "Hypnosis is something i never truly believed in (too many films) and never in a million years did i think that I would eventually try it. Why should I?" "I always thought it was nonsense. I did say that I am one of life's cynics, but I admit it here and now, I WAS WRONG. Thanks for a great book!" -William, U.K.
Dimensions (in inches): 0.25" x 5.5" x 8"